Pad Thai noodles is my kind of comfort food. 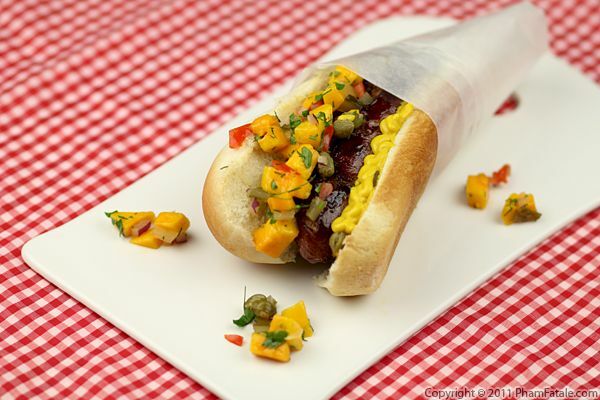 It's filling, flavorful and easy to make in veggie and non-veg versions. 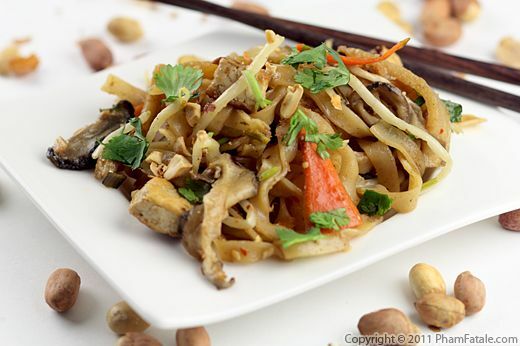 The noodles used in this dish are large rice noodles that are soaked until softened. They are sautéed in a thick, syrupy sweet sauce made of tamarind, sugar, chile and limes. To complete the meal, I added chicken sauteed in oyster sauce and fish sauce, which balances the saltiness of the Pad Thai sauce. This rice noodle dish freezes very well, so you will never order take-out again! We made an enormous pot of phở over the weekend and called everyone who likes this Vietnamese beef soup. I think my eyes were a little bigger than my stomach because I soaked 6 packages of dried rice noodles (bánh phở) and ended up with a ton of leftovers. Even though all the beef broth was gone, I managed not to waste the soaked rice noodles by making Pad Thai noodles. 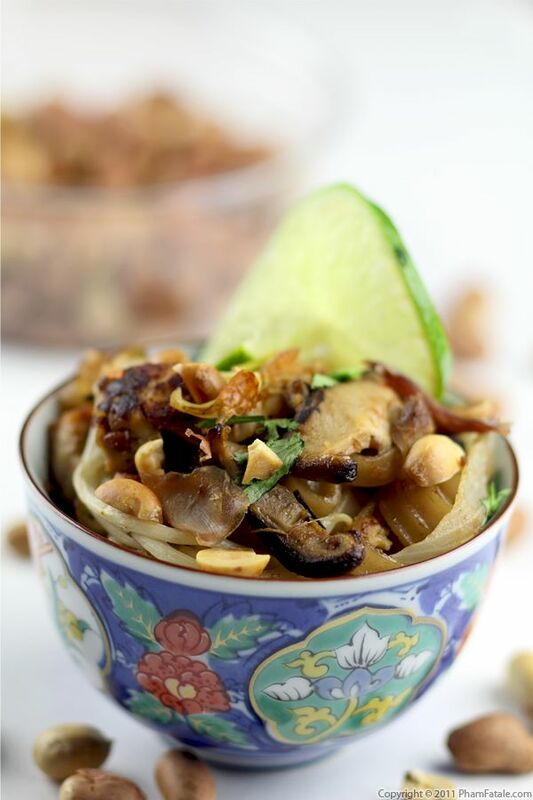 The dish is composed of rice noodles, tofu, limes, fragrant kaffir lime leaves, tamarind, palm sugar, peanuts and cilantro. For a meat version, you could add skinless chicken breasts, whole shelled and de-veined shrimp and shredded thin omelette along with the tofu and then finish the dish with fish sauce. If you're Vietnamese, you probably heard your mom telling you when you were a child not to waste food because it's "tội chết" (dreadfully sinful). Yesterday, I made gà muối ớt (salt and chile chicken) and there was no way I would toss the precious, flavorful chicken broth. So what to do with all the leftover broth? I made chicken rice with it. 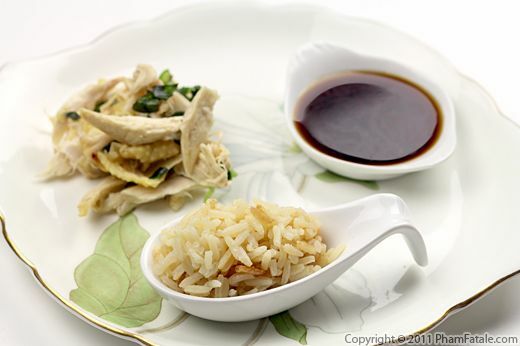 The preparation is similar to making basmati rice, with the main difference being that jasmine rice is used. Jasmine rice is a lot trickier to cook though, because the rice will get mushy very quickly if you don’t keep an eye on it. I served the rice with nước mắm gừng, which is ginger-flavored fish sauce. I wanted to make the flavors more intense so I used pure sugar cane juice instead of regular water. This dipping sauce is so good, I could drink it all by itself! As you may have noticed, I love sharing cooking tips. I recently told our family friend Cô Hoa that chicken salad tastes so much better if the chicken is boiled in fried-onion flavored broth. She invited us over to her house and we made a món ăn Miền Trung, "Central Vietnamese dish" in Vietnamese, called gà muối ớt (salt and chile chicken). The recipe is ultra simple. Cô Hoa assured me that all you need is the freshest chicken possible, ginger, a little chile and salt. Nothing more, thing less. 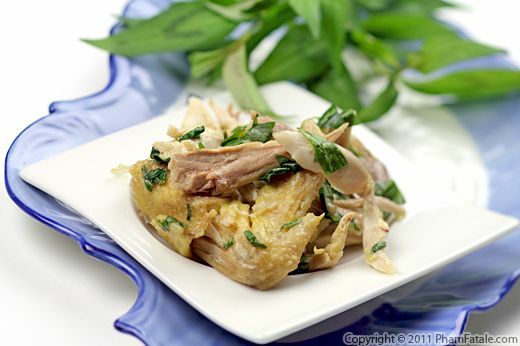 The chicken is cooled to room temperature, then shredded and mixed with rau răm, a fragrant Vietnamese coriander. You could either store the leftover chicken broth in the freezer for future use, or on the next day make cơm gà Hải Nam, which is a flavorful chicken rice. Nothing goes to waste! Page 8 of 16 pages.